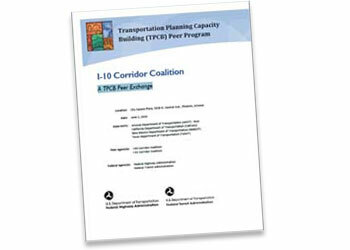 This report highlights key outcomes identified at the "I-10 Corridor Coalition" Peer Exchange held on June 2, 2016 in Phoenix, Arizona. This event was sponsored by the Transportation Planning Capacity Building (TPCB) Peer Program, which is jointly funded by the Federal Highway Administration (FHWA) and Federal Transit Administration (FTA). Why a TPCB Peer Exchange?